My first challenge: create a UX Architecture for the TLA (Tektronix Logic Analyzer). The only problem was, in 2004, there was no such thing as a UX Architecture. Front cover, Volume 2, the UX Vision, Personas, Scenarios, Work models. Front cover, Volume 3, design patterns, quality attributes and architectural principles. Front cover, Volume 4, Style Guide, UI components and behaviors. As a deliverable, the UX Architecture comprised four volumes, each focused on crucial "pillars" required to make UX a structural part of the TLA's product delivery process. But of greater significance was the organizational change resulting from the product line moving through the process of creating the architecture. Because of that process, the engineering teams, product management teams, program managers and senior staff all came to understand the value of UX as a strategic resource. Volume 1: The business landscape, including historic strategies, existing product strategies, development processes and the like. Volume 1 also provided overviews of the UX Vision and UX's integration into the development process going forward. Volume 2: The UX Vision in detail, including Personas, Context Scenarios, Work models and Key Path scenarios. 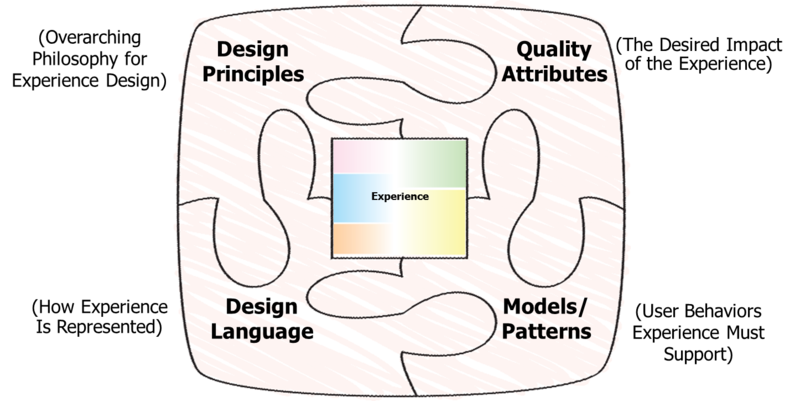 Volume 3: Design Principles and Patterns describing key design principles underlying the architecture, "quality attributes" of the experience and various use patterns. 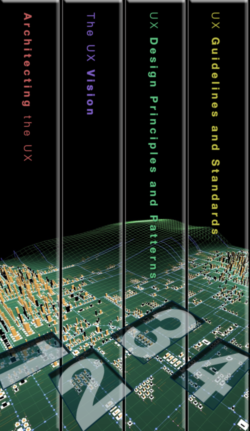 Volume 4: UX Guidlines and Standards, including a comprehensive style guide, pattern library and detailed minutiae. The process of crafting the UX Architecture enabled the TLA product line to continue my UX work long after I left the group. Excerpt from affinity notes as part of Contextual Inquiry. Excerpt from work models as part of Contextual Inquiry. User sketch of system under test as as part of Contextual Inquiry. Sketch of test bench setup as part of Contextual Inquiry. TLA screen of bad trigger result. TLA screen of good result. TLA screen of good trigger result. Sketch of system under test. Artifact found in user's cubicle: Ball Grid Array Key Map. I was about two weeks into my new job at the Logic Analyzer group, when my boss turned to me and said: "I'm the H/W architect, meet the S/W architect, Mike, and you're the UX Architect. We're both creating our architectures. How long will it take you to create yours?" I was nervous, it was my first month on the job after all, so I didn't know how to break the news to him - there was no such thing as a "UX Architecture," so I couldn't possibly estimate how much time it would take to create one! Since little research had been done, I instituted a "contextual inquiry" across multiple countries to learn how our users worked, their attitudes, behaviors and technologies they used to get their work done. My expectation was I would create many of the necessary deliverables (Personas, work models, context scenarios and the like) from these multi-hour interviews. Excerpt from video snippets database. After completing more than 30 customer visits (some with multiple users) I spent several months analysing the information, looking for commonalities across the work sites, job functions and industries. In addition, I created a "video snippets" database of the 100s of hours of interviews. This resource provided a keyword searchable set of 10-30 second videos. Using this archive of over 550 clips, I was able to further investigate subtleties in the users' workflows, terminology and work breakdowns. It also provided data to support my position that the TLA was virtually impossible to use, earning its epithet: "The instrument of last resort." One of several affinity diagrams from the Contextual Inquiry. One of the Personas for the TLA. An excerpt from the final version of Volume 1 of the UX Architecture. An example of an "Experience Schematic," a way of organizing related experiences in terms of proportional value (to the user) and adjaceny. An excerpt from a Context Scenario describing a Persona's desired experience for a new feature. Over several months I created work models, Personas, Context Scenarios, and "Experience Schematics," a creature of my own design. Finally, after more than two years, I authored the multi-volume set, organizing the information for multiple audiences: executives, engineering, marketing and program management, and of course, UX researchers and designers. A UX Architecture represented as four interlocking pieces around the central experience. With that said, several others contributed significantly to the research effort, joining me on the field trips, compiling results and helping with the analysis. I had a lot of help capturing key insights and received copious amount of critique on my proposed work flows and models. The video snippets database was a summer's work for our student intern. I was responsible for creative direction throughout the design of the books themselves: layout, typography and the cover/spline designs, relying on the expertise of a professional visual designer to execute on the work.